One bottle, many trips. Of the sugar cane that gives rise to the drink. Of the man who blends it. Of the refugees who give it a purpose. 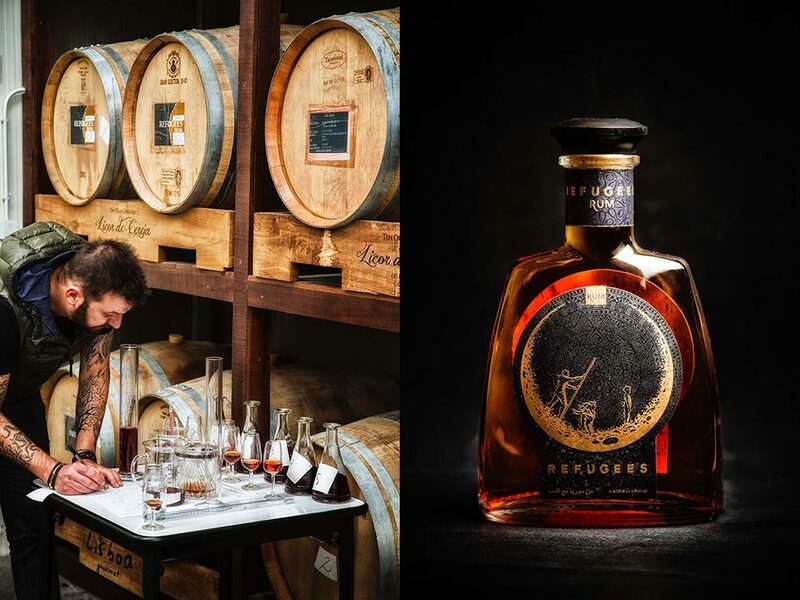 Refugees Rum, aged for 2 years at Licores Serrano warehouses in Serra da Estrela, is the result of a blend signed by Ljubomir Stanisic. Made from sugar cane – originally from Syria, in ancient Persia – it migrated along the Mediterranean Sea to the south of Spain, where it is distilled, and finally arrived in Portugal where it found refuge. After aging in barrels of French oak, where previously had passed whisky, Ginja liqueur and Douro wine, Refugees Rum was born. A rum with noble wood inside, with sweetness, elegance and subtlety. A rum with a very Portuguese soul – the same soul that led the Portuguese through these seas never before navigated … It is a soul that reflects the whole world. A world without borders, united by the universal language of discovery. Of hedonism. Of the pleasure of well-drinking. This story is told in only 1454 bottles numbered and illustrated by Mário Belém, with images that take us to the Middle East. On gold and black it’s represented a family that sets off in search of a better future, and a child looking at that promise, which is no more than a memory of the young Bosnian Ljubomir. The first rum signed by the most-Portuguese-Yugoslav-chef-ever is a rum with a mission that touches him especially: supporting the refugees, contributing to the possibility of a happier ending, like his own. Part of the value of sales of this reverts in favor of JRS – Jesuit Refugee Service, an institution that supports refugees in Portugal. With a retail value of around € 32, Refugees Rum is already available for purchase in the market and to taste, by the glass(es), at Bistro 100 Maneiras.